Info "This place is a pigsty!" 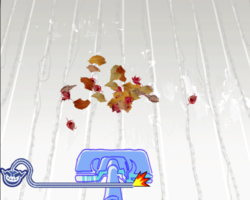 Spring Cleaning is one of Young Cricket’s Microgames in WarioWare: Smooth Moves. There will be a mess of leaves. The player has to vacuum them all up by moving the Wii Remote back and forth. Sometimes, a Fronk can be found in the mess. 1st level difficulty: Small mess. 2nd level difficulty: Larger mess. 3rd level difficulty: Large mess. This page was last edited on February 19, 2018, at 19:28.